I like ideas, and (as you might have gathered if you have read this blog at all) find them fascinating and motivating. But the most significant changes in my life have usually come not because of ideas, but because of the examples of others. When I find a notion concretely expressed in the life and practice of another person, that’s when I can see how it could change my life. 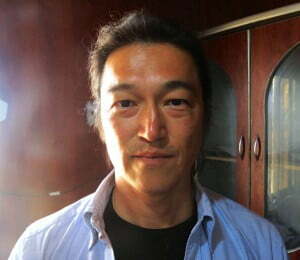 And this last week I have been incredibly moved by the example ofKenji Goto. Goto studied at Hosei, a private university in Tokyo, after which he worked for a media production company. in 1996 he set up his own business, Independent Press, and it was the following year that he became a Christian. His faith appears to have shaped not just his personal life, but also his approach to his work. He never liked to be described as a war correspondent; although he often faced great danger, venturing into war zones that other reporters refused to enter, he did so to report not on the fighting, but on those who were vulnerable and suffering, particularly children. He reported on the blood diamonds and child soldiers in Sierra Leone, on the victims of the atrocities in Rwanda, on victims of AIDS in Estonia, and the plight of children (especially girls) in Afghanistan. As well as producing video material for broadcast in Japan, he also published five books. It is hard to reconcile the soft-spoken, gentle man, who once paled in a bowling alley because the sound of the balls reminded him of bombs dropping on Iraq, with the image of a hardened war correspondent. But he covers wars with a difference. Instead of focusing on who is winning or losing, he tells the stories of ordinary people, especially children, who are forced to endure conflict and the horrors surrounding them. It is their resilience that inspires him, he says. When you ask how he reaches the dangerous places he reports from, he says he follows the footsteps of normal people getting on with their lives. They show him the way. Yet it wasn’t just his professional commitment which impressed people—it was also his personal manner, his care and his warmth. He told the stories of children suffering violence, hunger and nightmares…In a testament to his charm and integrity, people responded with an outpouring of support to try to win his release…Those who knew Goto said he was a gentle and honest man. It was this mixture of professional commitment, personal courage, and warm humanity which led him to Syria and his captivity. He wanted, first, to document the suffering of the people of Syria, to motivate the wider world to support them. Before he went there, hemade a short video in which he talks about the danger he will face there. If anything happens to me, do not blame the people of Syria. They have already suffered for three years. But he was particularly motivated by the plight of a fellow Japanese Haruna Yukawa. Yukawa appeared to be a troubled loner, who wanted to set up business as a military contractor, but was clearly out of his depth. “He was hapless and didn’t know what he was doing. He needed someone with experience to help him,” Goto, 47, told Reuters in Tokyo in August. When Yukawa was abducted, Goto felt obliged to do what he could to get him out of trouble. He thought that he would be treated differently from Western correspondents, in the light of Japan’s pacifist commitment which meant they had stayed out of the military conflict. But he was again realistic about the dangers he faced. “I need to go there at least once and see my fixers and ask them what the current situation is. I need to talk to them face to face. I think that’s necessary,” Goto said, referring to locals who work freelance for foreign correspondents, setting up meetings and helping with the language. It is hard to make sense of this tragedy in the light of Goto’s faith. But it is clear that he had no hesitation in ‘laying down his life for that of his friend’ (John 10. ) Goto joins a short but illustrious list ofnotable Japanese Christians. Christians are strongly against the Abe regime as being militarily oriented and nationalistic. When you think about the opinions of Christians in Japan, you can almost assume that they are generally more anti-nationalistic, more non-violence-oriented than the public. Christians should be peace-making, yet we need to be wise as serpents and give alternatives to the Abe regime. My family and I are devastated by the news of Kenji’s death. He was not just my loving husband and father to our two beautiful children, but a son, brother and friend to many around the world…. I remain extremely proud of my husband who reported the plight of people in conflict areas like Iraq, Somalia and Syria? It was his passion to highlight the effects on ordinary people, especially through the eyes of children, and to inform the rest of us of the tragedies of war. In the book of Revelation, uniquely in the New Testament, Jesus is described as the ‘faithful and true witness’ (Rev 1.5, 3.14), and this is embedded in the text by repeating his name 14 times, the product of 7 (meaning ‘complete’) and 2 (signifying ‘witness’ fromDeut 17.6). The word ‘saints’ (lit ‘holy [ones]) also occurs 14 times; we are to follow Jesus’ example in being faithful witnesses, even to the point of ‘not loving our lives so much as to shrink from death’ (Rev 12.11). 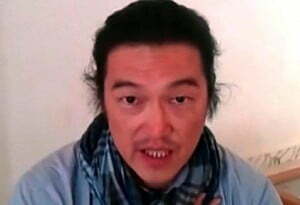 In exactly this sense, Kenji Goto has been, in life and death, a true witness, a martus after his Lord’s example.